Get your free “For Dummies” Ebook Today! While today’s state-of-the-art collaborative platforms (such as Microsoft, Google, and Facebook) are now accessible to small businesses, they have to be integrated with other softwares that provide specific solutions to each department within the company. The challenge is no longer to eradicate these tools, but to support their adoption and make them flexible in an everchanging environment. Collaborative tables were born with collaboration in mind. They excel at letting you share exactly what you want with who you want. 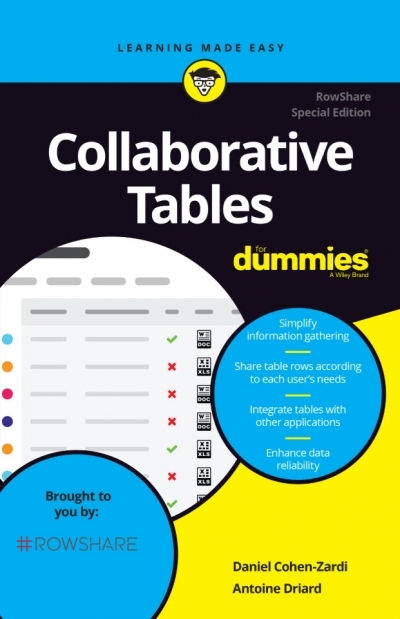 In our “For Dummies” ebook you will get a handle on a new approach to collaborative work. Use shared tables to do everything else: collaborate, consolidate, ask input on any list of information etc. From monitoring your business activity to collecting and disseminating financial information, passing by tooling your projects, various use cases are introduced in this ebook. Collaborative tables allow you, without necessarily being tech expert, to create and share tables along with simple calculations, but above all set a stage for a real collaboration. Much simpler than a database or even an online spreadsheet, so easy to use that your users will love it… and use it! Ready to be integrated with your other tools and your IT, if needed, save time by integrating collaboratives tables with them. Even without the help of your IT team, you can manage the integration process easily. To discover more, grab your “For Dummies” copy for free now ! We will send you a free copy of the full book, covering various real-life scenarios and hands-on examples. Create your free personal account. Then enroll your team for a 30-day trial of all RowShare Business features.